We are located 15 minutes away from the Meyer Corporation factory. They sell many name brand kitchen cookware such as: Anolon, Farberware, Circulon, etc. Once a year they have a huge warehouse sale. The products are heavily discounted. It is a very popular sale demonstrated by the crowds. We beat the crowds by making an early Monday morning visit. As some of you may know I hate to shop. I make an exception for this extravaganza. 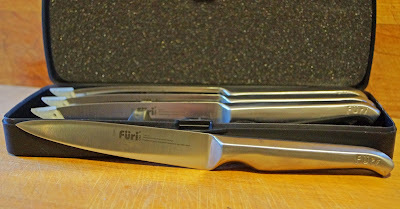 This year Rachael Rays Furi Pro Steak Knives Set found a new home. 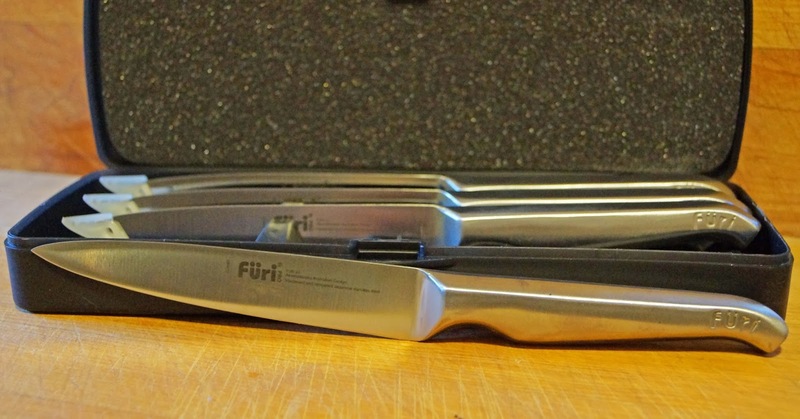 These knives are made of "Japanese high carbon stainless steel". They claim to have antimicrobial protection. They are heavy and feel comfortable in your hand. Now for the best part. They were only 10 dollars. That is my kind of shopping. They look great. How bad did they hurt your wallet? Greg, Ten whole dollars. We go to this sale every year. Now, that is a deal! Congratulations on a serious score! Zoomie, A few years back I bought Ms. Goofy a "Yan Can Cook Vegetable Cleaver" for three dollars. She still uses it all the time. Great sale. Thrre Dogs BBQ, It is too bad All-Clad does not make BBQ supplies. I was looking at some steak knives that were just as ridiculously priced as these, except the ones I saw were in the other end of the price spectrum. You got a helluva deal.